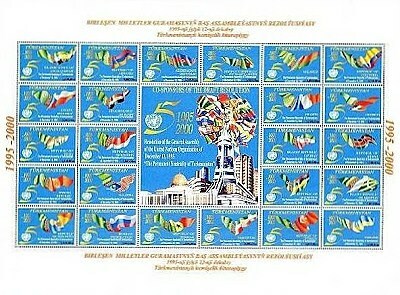 In 2000, Turkmenistan issued a souvenir sheet of 24 stamps picturing flags of various nations, and celebrating the United Nations' Declaration of the country's neutrality (Scott # 72). 5,500 were issued, and Scott '14 prices the unused sheet at $70.00. The set has multiple appeal to UN and Flag topicalists, and I believe that focusing on scarce popular topicals is a prudent means of speculating on stamps of the newly independent nations of Central Asia. Whether or not demand develops within these countries for the stamps that they issue, there will always be worldwide demand for their most popular topicals.